When do students submit their online tests? I am currently studying an Open University course (M888 Databases in Enterprise systems. There was an assignment due today, and like many students, I submitted only an hour before the deadline. That got me thinking, are all students really like that? Well, I don't have access to our assessment submission system, but I do work on our Moodle-based VLE, so I can give you the data from there. That is not exactly what I was expecting. Certainly, there is a bit of a peak in the last few hours, but there is another peak almost exactly 24 hours before that, with lesser peaks two and three days before. Note that all our deadlines are at noon (it used to be midnight, but that changed a few months ago). The graph above is consistent with our general pattern of usage. 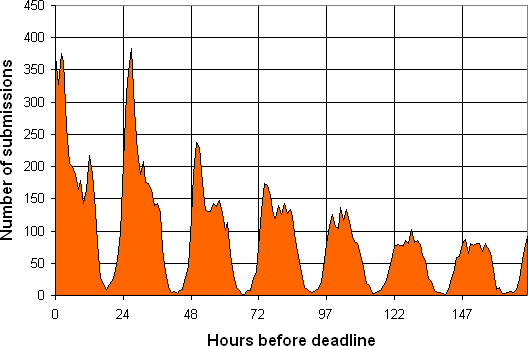 The following graph shows what time of day students submitted their quiz attempts. 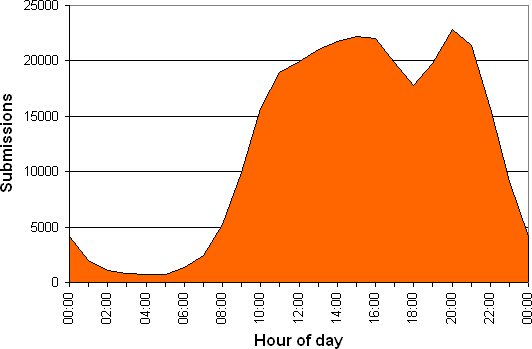 It is same shape as our general load graph for most OU online systems. I don't know what, if anything, this means, but I thought it was interesting enough to share.